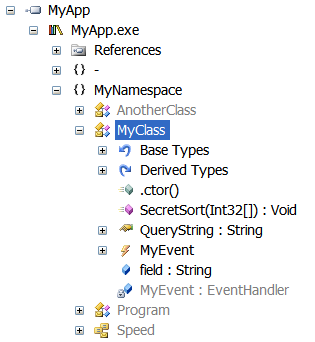 Crypto Obfuscator renames all your class, field, method, properties, methods, parameter and generic parameter names to totally different strings. It is impossible to determine the original names from the new names. This makes it impossible for someone to try to determine the purpose or functionality of the renamed entity from its name. Crypto Obfuscator can also rename fields or methods with different signatures to the same name. 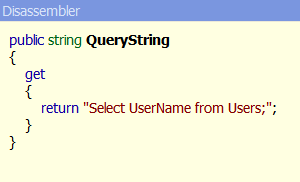 For example two fields having types int and boolean will be given the same name. Similarly two methods will different parameters will be given the same name. 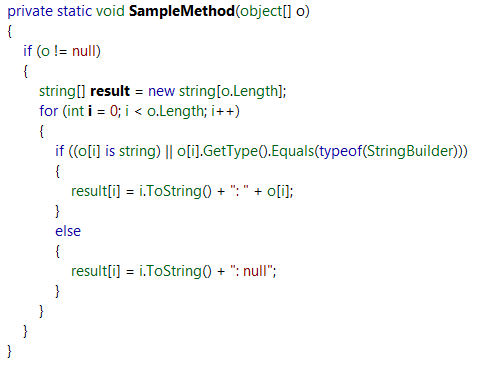 In the case of methods, the method return type is also used in the signature even though high-level languages such as C# and VB.Net do not support overloading by return type. 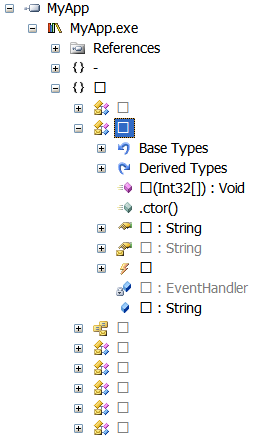 The .Net runtime is able to differentiate between the fields/methods without any problem since the signatures are different. Needless to say, this scheme makes it even harder to reverse-engineer your code. Crypto Obfuscator also has a renaming mode which renames all classes, fields, methods, etc to fake but realistic names like Domain/Log/Stream/etc (for classes) or Open/Close/Clear/Delete/etc for methods and so on. 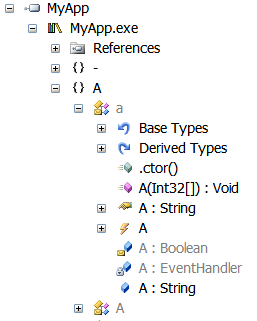 This makes it extremely difficult to differentiate between symbols excluded from obfuscation and obfuscated symbols. 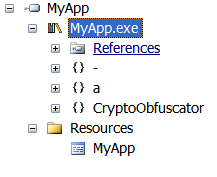 Crypto Obfuscator can hide calls to methods and properties from external assemblies such as those from the .Net framework. In addition, it can also do the same for unrenamed methods and properties from the assemblies which are being obfuscated. This provides very strong obfuscation and makes it impossible to determine when, where and how such methods and properties are used. Virtualizes, encrypts, compresses and hides the MSIL code within methods. If the method is viewed by a decompiler or disassembler, only a single proxy call is seen. Crypto Obfuscator can perform strong name verification of the assembly itself even if strong-name verification has been turned OFF on the machine on which the assembly is running or if the assembly has been registered in the verification 'skip-list' - this is typically done by hackers or crackers. Furthermore, the strong name verification is done using the original key used to sign the assembly when it was processed by Crypto Obfuscator. Thus, strong name verification fails even if the key is removed or replaced - again something typically done by hackers or crackers. Crypto Obfuscator's performs more than 10 advanced heuristic tests to detect if your software is running under a debugger or tracer. 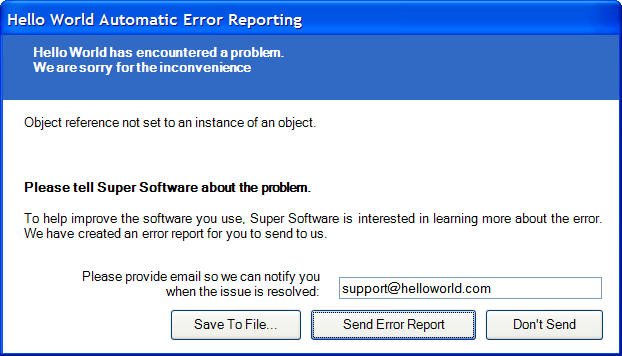 If detected, an exception is throw and your software will terminate. Both managed as well as native/unmanaged debuggers (including advanced debuggers such as OllyDbg) are detected. This provides a strong defense against crackers and hackers trying to debug or trace your software for various malicious purposes. Literal strings often contain sensitive information such as login information, passwords, SQL queries, algorithm parameters. They also facilitate reverse-engineering of your .Net code. 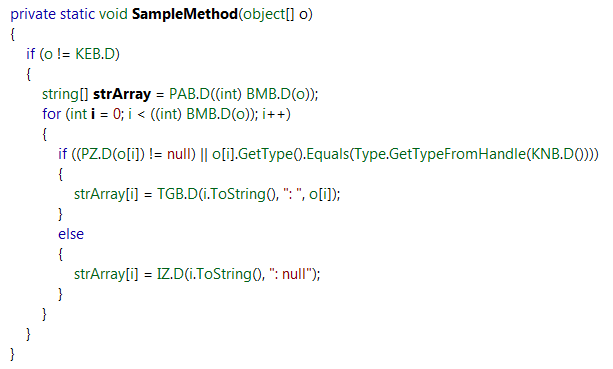 Crypto Obfuscator solves all these issues by encrypting all literal strings in your .Net code. Constant values or arrays can contain sensitive information. They also facilitate reverse-engineering of your .Net code. 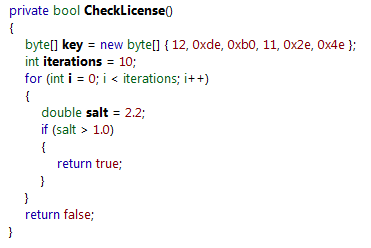 When this setting is checked, constant values or arrays defined and initialized in code are encrypted. 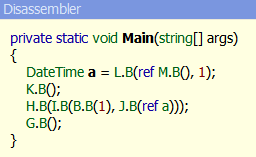 Many advanced decompilers can reconstruct the code in your methods including the exact structure of your loops, if-else statements, method calls, try-catch blocks, etc. This makes it very easy to revere-engineer your code. Crypto Obfuscator changes the structure of your code into spaghetti code while maintaining 100% the logic and output of the code. The result is that decompilers are unable to reconstruct the code structure and most of the times they crash while trying to do so. Code Pattern Masking masks some commonly used code patterns like using, foreach, is/as, unboxing, creation of arrays/structures, typeof, overloaded operators, string concatenations and more. These code patterns are replaced by method calls which do the exact same thing, but whose purpose is not as easy to understand as the original code pattern. When this setting is specified, Crypto Obfuscator will remove the value associated with all constant fields. 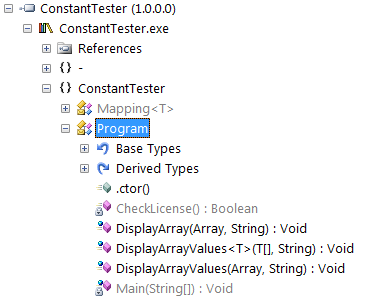 Constant fields are defined using const in C# and VB.Net. The constant value specified in source code is not required after compilation and so it can be safely removed. This provides extra security as well as optimization. ILDASM (Microsoft IL Dissassembler) is a free tool to disassembly any .Net assembly into MSIL (Microsoft Intermediate Language). 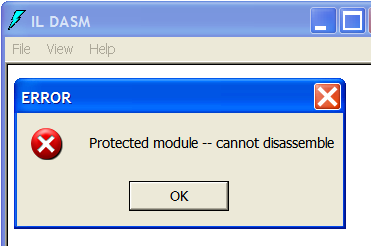 Crypto Obfuscator can modify the assembly in such a way that ILDASM refuses to disassemble the assembly. 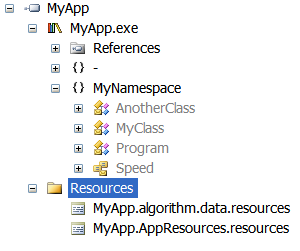 Many tools exist which can extract resources from your assembly. Such resources can often contain valuable, sensitive or copyrighted information such as images, UI (WPF BAML files), textual content, etc. Crypto Obfuscator can encrypt all such resources so that it is impossible to extract them from the assembly. Crypto Obfuscator can encrypt all dependant assemblies and any additional assemblies you want into a single assembly. This makes it impossible for someone to get their hands on individual assemblies. 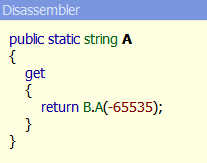 You can use this feature to package all important and sensitive code/data into another assembly. 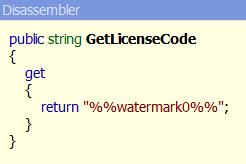 Crypto Obfuscator can embed watermark strings into your deployed assemblies. This can be used to track each assembly instance - this is commonly used for licensing by embedding user name and license codes as watermarks to deter license violations. The watermarks embedded in the assembly can be used in literal strings and constants to be used in your UI, message boxes, etc. 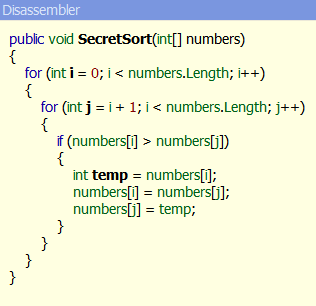 Crypto Obfuscator can remove unnecessary or redundant information such as parameter names, property/event placeholders, etc from your .Net assembly . During symbol-renaming, Crypto Obfuscator will often assign extremely short (often single-character names) to your classes, fields, methods, etc. 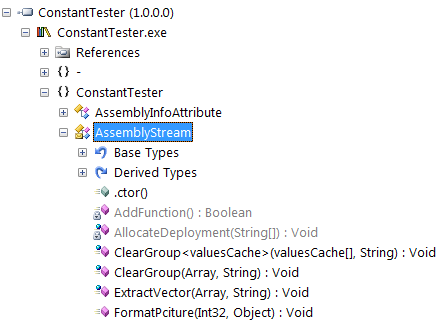 All these features can reduce the size of your .Net assembly considerably. Crypto Obfuscator can eliminate duplicate uses of the same string literal and replace them with one instance of the string. This reduces the size of your assemblies. 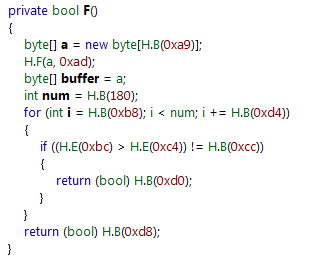 Crypto Obfuscator can do certain changes to your assemblies which result in runtime performance improvements. Automatic Re-signing of assemblies using normal snk files as well as password protected pfx files. Support for obfuscating .xap files. Full support for debugging and pdb files. Visual Studio, MSBuild & ClickOnce integration. Command Line Support - Integrate in your build process.